A physical workout is not only beneficial for your dog’s physical health but also will help his mind with coordination. According to a report released by the Association for Pet Obesity Prevention, 53% of American dogs are overweight! Our dogs requirements are the same as ours: Eat Less, Move More. If you are concerning with starting a workout program call our office and visit with our vets. A fitness vest is a fitted vest that you can put on your dog and add different amount of weights. Adding this vest will add strength-training. First decide on an object to have your dog put his front feet on. Small breeds you can use the staircase, larger breeds you can use a chair. Next, lure your dog to “Paws Up” or put his front feet up on the object. With “Paws Up” get him to “Sit”. The trick is to keep him front paws on the object as you lure him to drop his rear into a sitting position. Then tell him “Stand” and lure him back to his original position. Your dog has successfully completed his first doggie squat! Circuit Barkers are when you do a series of exercises that you can combine into one workout session. Next, do some “Push-Ups: “Sit, Down, Sit, Down” and repeat a number of times. 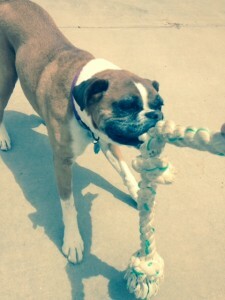 Now, let’s play a game of tug-a-war. You could place his back legs on a step or curb, which will allow him to work different muscles. If you want to get a good workout in for yourself, you can play in a squatting position. Go for another walk or jog around the block. So next time you are trying to find motivation to go workout at the gym, don’t overlook your potential workout partner wagging his tail at the door! Please call our office at 505-869-2627 and we will be glad to answer any questions you may have.